Saralyn Harder’s short commute to a temporary job in a barbecue food truck at the edge of a Florida town winds through a paradise violently deconstructed. Two months after Hurricane Michael, Harder can drive straight down scenic U.S. 98, no longer a slalom course of 15-foot debris piles. Many heaps remain, pushed to the side of the road, rained on and picked through, part of Mexico Beach’s new topography. Sagging stilt homes loom over discarded ovens, scraps of insulation, siding and shingles, identifiable ruins outnumbered by the indistinguishable shards of life before. The local market where Harder worked is gone. Her favorite tiki bar at the El Governor motel, where she drank cold beers with friends by the water, was destroyed, too. Her rental home survived, albeit with a greasy sheen on the floor from muck that not even four rounds of bleach could erase. She retreats there each night, with a shot of Hornitos Reposado Tequila and Sprite, and tries not to think too much about the damage or the past, when she would gaze at the tilting palms and white sand over her steering wheel. “I’d see this beautiful place and I would say, ‘Thank you, God, for letting me live here,’ “she said. The sun sets early in winter, at least, and for a while after she leaves work, Harder cannot see beyond the streetlights. She imagines for a few minutes that Mexico Beach is a nice place to live again. Each weekday, Harder drives to the Jarheadz BBQ food truck, where she hands out steaming Styrofoam trays of pork beside a white revival tent serving as a pop-up donation center. “You can’t rebuild a town on peanut butter and jellys,” said co-owner Brian Padgett. He and his business partner rolled into Mexico Beach from Alabama weeks ago and have been paying about $400 to $600 a day for groceries and $3,000 a month for diesel fuel to power their generator. They ask for donations instead of charging by the plate. Padgett’s partner, Todd Weaver, served as a Marine in the first Gulf War. He cried when he first drove through the town after Hurricane Michael. “With the exception of everything being scorched, this is like a war zone,” Weaver said. The food truck shares traffic with the donation center, filled with pallets of supplies donated by church groups and nonprofits from across the country. Residents stuff plastic shopping bags with things they never expected to need so badly: crackers, jeans, soap, jars of peanut butter and jugs of bleach. “Get whatever you need and come back any time,” Pam Sellers says as they load up. She used to work at a coffee shop in Mexico Beach, but now she wears a red baseball cap that says “Make Mexico Beach Great Again.” She’s living with her cats in a friend’s shed a few miles north of the tent. “It’s like a third-world country,” she said. Produce is one of several unexpected treasures in Mexico Beach now, like bundles of fresh lettuce, which Sellers said left people “freaking out” at the tent. To another volunteer, Jon Douglas, new tube socks felt like heaven. Inside the donation center, Alyssa Evans grabbed diapers, cereal and formula with her four children and mother-in-law. She is due with another child in February but has not heard from her usual doctor since the Oct. 10 storm. A certified nursing assistant, Evans has been out of work with hazard pay, and driving more than an hour to Destin for doctor’s appointments. She held her youngest daughter on her hip while her oldest grabbed a pair of Velcro sneakers for her brother. Demolition workers have replaced winter tourists across the three miles of Mexico Beach’s shoreline, now dotted with portable bathrooms. The area was never exactly bustling, a point of pride for about 1,200 residents, fiercely protective of their quiet coastal retreat. There wasn’t even a school within town limits. A bus picks up a handful of kids who go to classes down U.S. 98 in Port St. Joe. Everywhere people have stretched blue tarps across cracked roofs and planted American flags in the rubble, which go for $19.99 at the Piggly Wiggly 12 miles away. Bizarre markers of destruction still haunt the roadway – an arranged furniture set in a room with no ceiling or walls; grits, orzo and bread crumbs in an open pantry, visible from the street. The smack of hammers mixes with the bleating of heavy machinery, forming a rhythm to daily life. Sand is everywhere but where it’s supposed to be. 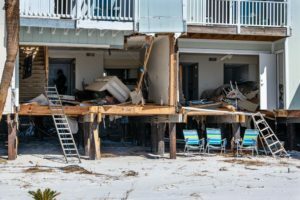 Before Hurricane Michael, Kimberly Shoaf, president of the Mexico Beach Community Development Council, said officials were only patching some swaths of washed-out shore. Many people sleep in RVs or campers bought after the storm, at lots packed with neighbors from around the sleepy stretch of towns they call the Forgotten Coast. Most are still haggling with their insurance companies or the Federal Emergency Management Agency, and trying to inventory what they once owned. Signs for the new economy line the roads, touting mold treatments and debris removal. Many doors still bear green stickers, meaning they were searched and cleared for survivors, or red, meaning the buildings are unsafe. Others carry signs that say for sale or for rent. A few businesses in Mexico Beach have begun to re-open, including a pump and supply company and Crazy Beach Pizza, serving out of a walkup window in a space halved by the hurricane. The pizzeria used to be orange and bright inside, but now the small dining area is primer-gray, with three booths and a space heater. Out-of-town contractors keep the lunch hour busy, digging out cash from heavy work clothes. Local residents, too, flock to the restaurant for a sliver of normalcy. John Deeson and Justin Hart, who work for a local air conditioning business, stopped in early December for sodas and calzones, shocked to see Crazy Beach Pizza was serving food again. “Every place that I know the most about is gone or destroyed or getting plowed over,” said Deeson, who grew up in the area. “You can’t even get you a can of snuff or a cup of coffee,” Hart said. Life now, they said, is work – for pay during the day and on their yards and homes at night. “Five years, Mexico Beach’ll be back,” Hart said. Across the table, Deeson looked skeptical. A couple blocks from the pizzeria, Laurie June sits outside two shipping containers, neatly packed with clothes and quilts and other supplies in a second donation center. “Everything is a struggle every day,” she said. Trash bags are a frequent request. But she takes solace that the containers are tidy, a kindness amid devastation. Hurricane Michael took away yards, making it hard even to let dogs out to the bathroom. Brewing a cup of coffee is a delicate routine in June’s 24-foot camper, which leaks every time it rains and has only two working electrical outlets. Her clothes, salvaged by her husband from the wreckage of their home by a canal, sit in a tote in a shed outside. Duke Energy rebuilt the power grid, and weeks after Hurricane Michael, the city was able to get water and sewage service back to many areas, except several spots south of U.S. 98, where some equipment is full of sand and all that remains for long stretches are concrete slabs. June’s husband has steady work, at the town’s Ace hardware store that Mayor Al Cathey and his son reopened in a warehouse that used to hold plywood and trim. Cathey is a descendant of some of Mexico Beach’s founders, who built up the town in the middle of the 20th Century. “When you drive the streets every day, it’s difficult even now to wrap your arms around what’s missing,” he said. Trucks pull up next to the hardware store all day, but business is different. The Catheys don’t carry beach pails and plastic shovels anymore, or fishing gear. Their stock of hammers is down from 10 types to three. Roofing nails, screws, plywood, though – they’ve got the basics.